How Do You React When Your Priors Are Disconfirmed? I am grateful to Xenocrypt for directing me to the cool site Our World in Data, run as a public good by Oxford University. The above is based on that site’s data on social spending, defined as “health, old age, incapacity-related benefits, family, active labormarket programmes, unemployment, and housing”. 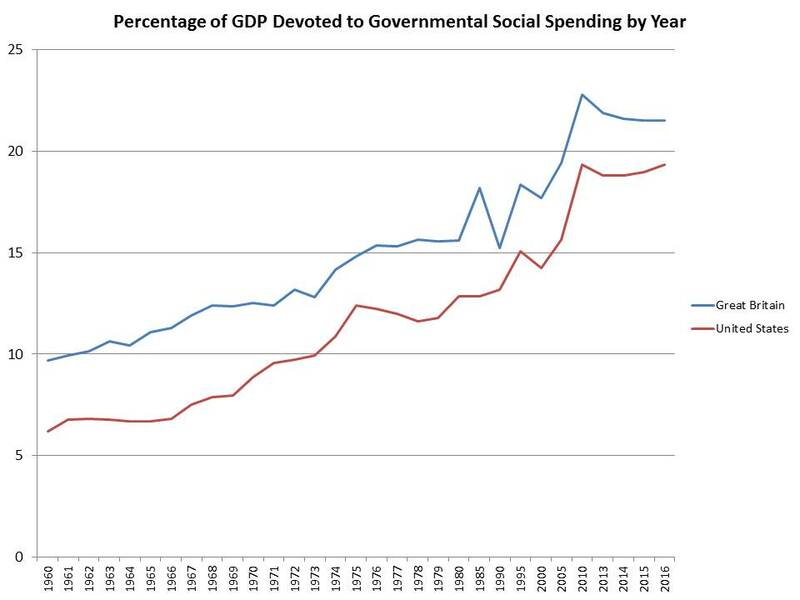 Independent of the surprising pattern, I wonder how many people react to these sorts of data entirely by attempting to defend their priors, e.g., “There is no way Reagan spent a higher proportion of GDP on social spending than LBJ!” (Or Cameron than Brown in the UK). It’s very hard to overturn strongly held beliefs, perhaps even moreso in a Twitterized world where people instinctively defend them without really thinking. No president of either party has reduced the size of government because voters do not want it reduced. They want big government. I do want to take the opportunity to ask if anyone has a good explanation of "Wagner's Law," or can suggest a good book that deals with it. Short book is desirable. I think that the graph illustrates it but an informed opinion would be received with gratitude. Thanks for this. I had never heard of Wagner's Law, but it certainly seems consistent with the data. Just a point of clarification, for the US. Is that federal; federal and state; or federal, state, and local? "No president of either party has reduced the size of government because voters do not want it reduced. They want big government." I'm not sure that's entirely correct. I would bet that the vast majority of the growth seen in the graph is the inevitable consequence of entitlement spending growing as the population ages, as lifespans increase and as medical advances result in the existence of more things that could conceivably be paid for by those entitlements (e.g. government expenditures on heart transplants were, um, modest in 1960). It is correct that people want their entitlements, or at least the current entitlements. But there are lots of categories of "government social spending" that are not broadly-available entitlements and the enduring and universal popularity of these is by no means a certainty. I don't think you can draw significant conclusions about social policies from total social spending alone. I know that for European countries, public social spending is dominated by healthcare and pensions, which tend to make up two thirds of public social expenditures. These expenditures tend to rise not because of specific policies, but because of an aging population and advancements in medicine. I don't have the numbers for America – mostly because American social spending is so fragmented that it's difficult to figure out the numbers – but I'd be surprised if it were substantively different. This is more of a "needs must" situations, where policy choices are limited. If we look at the OECD's social expenditure database, we can see that America both has among the highest net social expenditures (public and private spending combined), second only to France, and the lowest public social expenditures (as a percentage of GDP). This is far more indicative of policy choices; America does put a disproportionate amount of the burden on the individual. 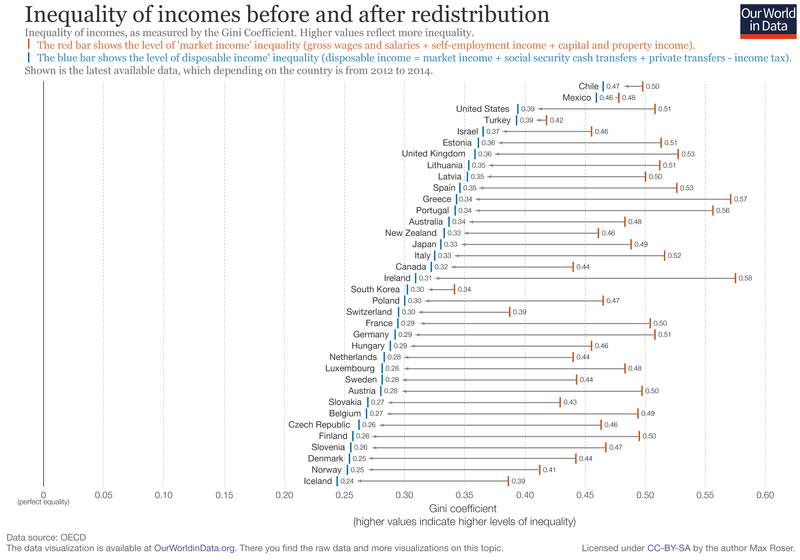 This is also reflected in the fact that social transfers in America are not very redistributive. Whereas income inequality in America before taxes and transfers is not much different from Germany and France, it is dramatically higher after taxes and transfers. I'll also add that the UK does not make for a good point of comparison if you want to study social policies; Britain has about the highest income inequality in Europe and has one of the lowest tax bases among the wealthy European countries. This is exemplified by, for example, having one of the stingiest unemployment benefits among wealthy European countries. Finally, a lot of critical social policies do not show up prominently on the balance sheets. These include things such as the financing and destigmatization of public transportation (local and regional public transport generally loses money and needs to be subsidized, though the subsidies aren't that large), urban planning (no food deserts, please, and walkable and bikeable neighborhoods), and sane housing policies. "Whereas income inequality in America before taxes and transfers is not much different from Germany and France, it is dramatically higher after taxes and transfers." This is a fascinating data point that I have never heard before — thank you. On another of your points, do you think it is possible that unemployment benefits are more generous outside the U.K. because of political risk that comes with low unemployment benefits in countries that adopt policies that ensure high unemployment (e.g. France). The Eurozone's unemployment rate is more than double the U.K.'s — that's a lot more voters who might punish politicians for low unemployment benefits. (1) Benefits are subsistence level only. In other countries, there's generally a transitional period of 1-2 years where you receive a percentage of your previous income, before subsistence level benefits kick in as a fallback. (2) Benefit sanctions are comparatively harsh. In theory, you can lose JSA for several months just for failing to show up for an appointment. (3) You do get significant in-work benefits to top up your income if pay is low, as long as you're working. This pretty much forces people back into work at all costs. In Britain after the financial crisis, the result was an oversupply of labor; while unemployment was low, this led to severe wage depression. The UK was the only country in the EU with both a growing economy and falling real wages (FT article (unfortunately behind a paywall), direct link to the graph). So, the low unemployment in the UK seems to be at least in part the consequence of the benefits situation, whereas better benefits in other countries allowed the unemployed to hedge their bets. Conversely, while there have been benefit reductions in some other European social democracies (such as Germany and Denmark) there is no mechanism that would entice them to adopt the British model. Benefits that scale with income are considered to be an important automatic economic stabilizer in the case of a recession, for starters. Denmark cut the maximum length of full unemployment benefits from four to two years, for example, but they're still 90% of your salary. A secondary effect may have been a slightly higher rate of underemployment compared to the rest of the EU, though that effect was minor at most. Second, the Eurozone or EU-28 average for unemployment is misleading. It is primarily kept high by poor southern and eastern countries; the traditional social democracies mostly do fine. France and Finland are the exceptions. Finland has economic problems for other reasons (a trifecta of Russian sanctions, Nokia's collapse, and the downturn in the paper industry), and France is sort of the opposite of the UK (an overregulated rather than a deregulated labor market). France, in general, is sort of the exception among European social democracies. The other wealthy ones (i.e. the Nordics, the Benelux countries, and Germany/Austria/Switzerland) are coordinated market economies (in contrast with the liberal market economies of the Anglosphere). France tends more towards traditional socialism, including a fairly large state-run sector of the economy. Also, as with the UK, the relationship between unions and employers tend to be antagonistic, unlike the cooperative approach that is common in the CMEs. And unlike the UK, the unions still hold actual power. Thanks for this Katja. I don't find international wage growth analyses compelling unless they include the whole eligible workforce (i.e., average in a zero for everyone who is unemployed). The reducto ad absurdum of not doing this is a policy that keeps 99% of the population unemployed — of course the few people allowed to work command huge salaries, but so what because everyone else has zero wages. The discontinuity round 2010 is striking. The spending fell in both countries, with opposite changes in the type of central government: in the UK from Labour to the Tory-dominated Coalition, in the USA from Bush to Obama. The financial crisis seems to have dominated politics. In the USA, it may be because contraction in state budgets swamped the feeble federal stimulus. Yup, we are getting older and feebler. The things the old and feeble need are provided more by the public sector, so public sector spending rises. Where's the surprise? As many have pointed out, the striking comparative datum about US public expenditure on medical care is not that it's stingy, but that it's so ineffective in covering the population and maintaining its health. Economists tend to see this as a choice (which it is, in a way). But if you look at the history of social programs, they were usually driven by a combination of the demonstrated failure of all the alternatives (pure private provision, subsidised private provision, not-for-profit, subsidised not-for-profit and so on), often after a few decades of desperate band-aid measures, and well-founded fear of real political retribution. Governments have embedded powerful mechanisms that restrain expenditure (the Treasury, Expenditure Review Committees, hearings and others). The real causes are simpler – more complex, less personal societies require more centrally spent on infrastructure and maintenance. If 60 per cent of the adult population is in paid employment, then family-based age and childcare is not going to work. If the whole population needs as high degree of literacy, then dame schools will not do the job. If every home and factory needs reliable 110V 10 A power, then bankruptcy is not an option. The US is able to stick with expensive. inefficient hybrids more than most, but even it runs up against this obvious truth (witness health care, where it spends twice as much to do less, and the government still picks up half the tab). Next Next post: You know where they really need the public option? Trump Country.